It’s summer time in the Emirates, and we’re on a roll with our Cold Brew Iced Teas. Not only are they incredibly easy to make, you can pretty much use any fruits or herbs to your liking. 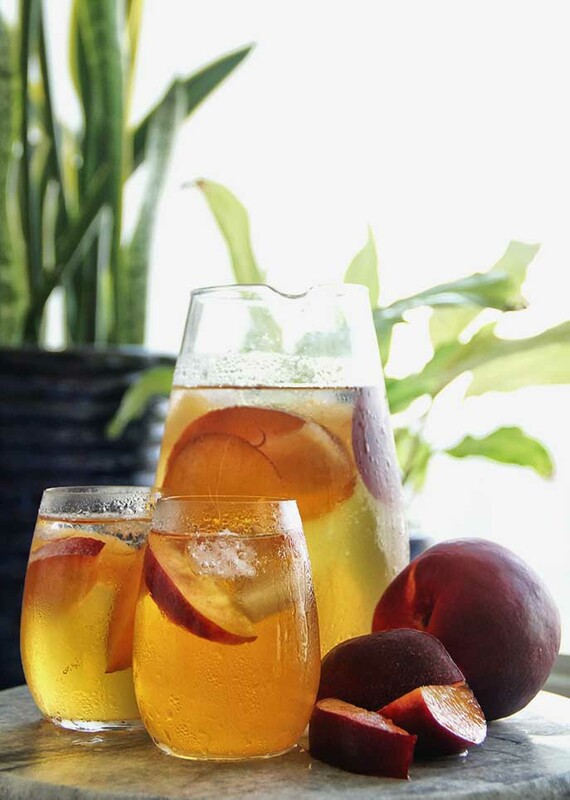 Stone fruits, such as Nectarines or Peaches, paired with juicy ripe Honeydew Melons are such a succulent and sweet combination, perfect for the summer. The taste is floral, crisp and refreshing, reminiscent of a cold Riesling or Moscato. We’re in love with this one. Stone fruits are known to create collagen, potassium for your nerves and muscles and fiber. Honeydews are rich in potassium, regulates insulin production with low glucose (preventing Diabetes) and curbs hypertension. White leaves are processed only minimally after they are harvested, so they hold onto most of their naturally occurring antioxidants. Antioxidants protect us from free radicals, fight harmful inflammation, improve cardiovascular health, reduce our risk of chronic disease (like cancer and diabetes), encourage a healthy immune system, and much more. It also helps fight against Diabetes and promote dental health. This particular Iced Tea is brewed Cold Brew style. Just combine the ingredients and refrigerate overnight. The result is very balanced, subtle and refreshing Iced Tea. Cover and refrigerate overnight. We recommend tasting the tea on the 6th hour and determine to your liking. Once your preferred time has been reached, strain all the ingredients out of the pitcher and serve. Made by : Yvette A.